Apartment in the historic center of Seville (50 m from the Basilica de la Macarena and 300 m from the Alameda de Hércules). Cheerful apartment in historic center of Seville. Modern, bright and functional apartment (Wi-Fi included) with a great location in the historic center of Seville. Inside the flat we could highlight the renovated bathroom, a spacious room and a large and bright living room, equipped with 32 "flat TV, DVD, stereo, Wi-Fi, etc. This apartment is located in a building of 1996 with a large central courtyard, which makes the apartment very bright and quiet, as all the windows to this patio and not on the street. As for its location, it is certainly very good, which is very close to the following monuments: "Basilica de la Macarena", "Parliament of Andalusia", "Convent of Santa Clara", "Luis Church of San", etc. , and also around the corner you can see the Muslim walls, the river of the city (Guadalquivir), the Universal Exhibition maintain in 1992 and the theme park "Isla Mágica". Facilities and appliances. Bathroom: bath with shower, toilet, washbasin, bidet, hairdryer, towels provided. Bedroom: 1 double bed (135x190cm), closet, sheets and bed linen provided. Living-room & sitting-room: flat TV 32", DVD player, sofa-bed (135x190cm), table and chairs (seating for 4 persons), cd player, radio, books. Kitchen: ceramic hob with 2 burners, fridge, freezer, microwave, toaster, coffee maker, kettle, sandwich maker, cooking utensils. General: air-conditioning, central heating, iron, ironing board, hairdryer. Internet access: Wi-Fi included. Additional services: bed linen provided, towels provided, aiport transport under demand, housekeeper optional. General information. Property type: self-catering apartment. Location (address): street Becquer. Capacity (sleeps): 2-4 persons. Surface area: 60 m2. Internet: Wi-Fi included. Layout: bathroom, bedroom, livin-room & sitting-room, american kitchen. Floor : first floor in a 4 floor building. Closest airport: Seville airport (named San Pablo), 7 km. Railway station: Santa Justa Railway Station, 1.5 km. Bus stations: Prado Bus Station (2 km) and Plaza de de Armas Bus Station (2 km). "Basic accommodation but it was just what we wanted.In a quiet area that gave easy access by bus to the tourist area"
"Staying in apartment Becquer is like living in Sevilla, rather than just visiting. It is very close to many amenities, and the Alameda de Hercules which has a lovely atmosphere in the evenings. The apartment was clean, tidy and comfortable and I would happily stay there again. We were made to feel very welcome." "Thanks so much to Nacho for his welcome and his reactivity! The appartment was really nice and close to the description. Some bed sheets were missing and the sofa was broken but Nacho came immediately to solve the issues! The appartment is really well located, close to Macarena Church and to all the buses to visit the city. But anyway, Sevilla is easy to visit by walk! Wonderfull city, nice people, we loved our stay and will come back! "The apartment is located in a wonderful position - near the centre yet in a very "local" neighborhood, half a block from the beautiful "Basilica de Macarena" and very near to the bus stops. The air conditioning worked perfectly, as the rest of things in the apartment. Seville is a wonderful city and we hope to be back soon." 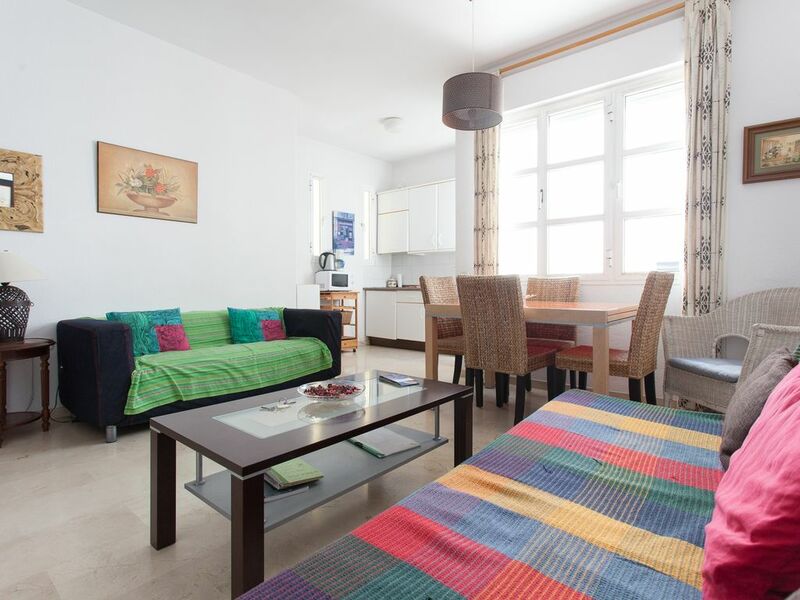 "Spacious and well equipped flat, very close to the Macarena church and a vibrant area of Seville. Owner very helpful and all as described. We hope to return." "Very clean. No noise. Close to restaurants, supermarkets, (small shop a walk away open on Sundays since supermarkets not) and bus services. No real view, you can see the sky and opposite flats - lovely patio if you look out window though. Flat kitted out well. Air con a blessing in a city like Sevilla in summer. Easily found from train station + Bus. Bus Terminus outside + opposite Major monument of La Macarena and the Wall is your guide. NB be prepared for LOTS of walking - public transport does not always get you close enough to where you want to be!" Address: Calle Becquer. Located on the first floor. Facing: East, Views to the front yard. Distances to the main monuments of Seville: Cathedral and Giralda (1,7 km); Alcazar (1.9 km); Bullring (1.8 km), Casa de Pilatos (1.3 km), Archivo de Indias (1.7 km); Hospital of the 5 wounds (200 m.); Roman walls (50 m); Calle Sierpes (1.3 km); Alameda de Hércules (300 m); Basilica of the Macarena (50 m); Plaza de España (2.5 km); Torre del Oro (2.1 km); Manufacture of tobaccos (2.1 km); Expo 92 (900 m); Isla Mágica (700 m). Activities nearby: amusement park, boat trips, casino, cinema, horse riding, golf, horse riding, amusement park, municipal swimming pool, museum, night club, spa, thalassotherapy, theater, thermal baths. This apartment is located in the Macarena neighborhood of Seville, an area characterized by narrow, crowded streets, small shops, typical lights of the Sevillian streets, etc. Near the apartment you will find everything you need: laundries, supermarkets, parking, banks, restaurants, bars, parks, etc. (you will find more information on all this in the apartment). As for the historical legacy, these are the closest monuments and landmarks for the Bécquer apartment: Basilica de la Macarena, Parliament of Andalusia, Convent of San Clemente, Church of St. Louis, Muslim Wall, Convent of Santa Clara, Barqueta Bridge , Isla Magica theme park, etc. (you will find more information on all this in the apartment). Other distances: Airport (7 km. ), Bank (50 m), beach (100 km. ), Bus station (1.5 km. ), Bus stop (50m. ), ATM m.), Shops (50 m.), Metro (1,5 m.), Cafeteria (50 m.), Park (100 m.), Pharmacy (100 m.), Restaurant (50 m. Km), Supermarket (50 m.), Taxi rank (50 m.), Town center (interior), Train station (1.5 km. ), Nearest bicycle stop (50 m.). The bus stops near: C5, 2, 13, 14, C1, C2, C3, C4. Click on http: // www. cough com / for more information. Nearest metro station: Line 1 (Puerta de Jerez). Click on http: // www. subway station org / for more information. Nearest public trails: Calle Resolana (post # 13). Click on http: // www. sevici. com / for more information. - Prices shown per week are only in reservations of 7 nights for 2 persons; the price depends on the number of people staying as well as the lenght of the stay. - Deposit asked to confirm reservations.